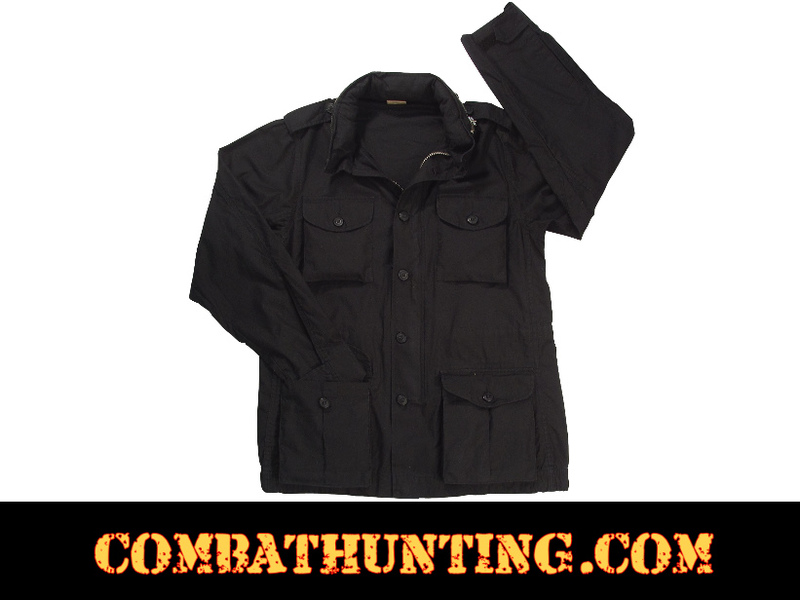 Rothco Lightweight Vintage M-65 Field Jacket Color Black 100% Cotton (Washed) Button Color Matches Jacket. 4 Front Pockets With Button Down Flaps. This M-65 Field Jacket Have Hook And Loop Closure At The Sleeve End. Jacket Has Hood, And Collar With Zipper Pouch To Hold Hood When Hood Is Not Is Use. Front Zipper With Washed Cotton Cord On Zipper Pull With Button Closure Storm Flap Over Front Zipper. Jacket Neck Area Has Buttons For Neck Closure With Hook And Loop For Tight Fit. Drawstring Adjustment In Mid- Waist Area And Bottom Hem Of Jacket With Snap Closure On Front Bottom Hem Area.